Skiving burnishing is a method of finishing the hole with the honing head of rolling tool. 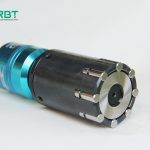 The honing head of Roller burnishing Tools is driven by the main shaft of the machine tool, and it is rotated at low speed while moving up and down. The honing head is equipped with a number of roller grinding strips to pressure on the surface of the workpiece. When rolling the honing head, a thin layer of metal is cut from the workpiece. 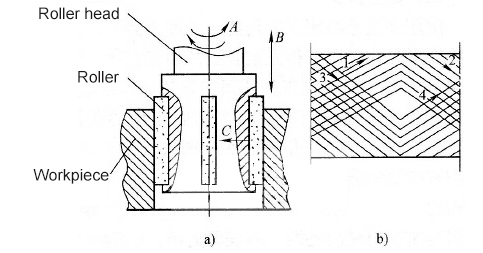 The cutting track of the roller burnishing tool on the workpiece surface is intersected and not repeated. When honing, a large amount of cutting fluid should be added to cool and lubricate, reduce the cutting temperature, and wash away the broken abrasive grains and debris. The general honing uses kerosene and a small amount of total system loss oil as cutting fluid. 1) honing can improve the surface quality, size and shape precision of the hole, but because the honing head and spindle are floating connections, honing cannot improve the position accuracy of the hole. 2) the surface of honing is intermeshed, which is conducive to the formation of oil film, good lubrication performance and wear resistance of workpiece. 3) there are more grinding bars and high productivity during honing process. 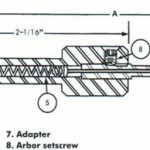 The cutting direction of the grinding strip often changes, and it can keep the sharpening for a long time. Honing is mainly used for the finishing process of the hole, its dimensional accuracy can reach IT6~IT4, the surface roughness Ra is 0.2~ 0.05, and the main use is for the mass processing oil cylinder, cylinder and other workpieces.